The springs of your garage door may be in despair without your even knowing it. If this is the case, they might just break and bring your door crashing down on top of you or your car. This is a tragedy that can be avoided with the help of J & K Garage Doors. We offer a variety of garage door services. Our service technicians are well-qualified and they have received the necessary training in order to repair any worn garage door springs. 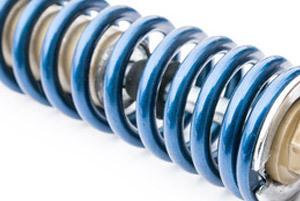 If you suspect that you have a worn spring, contact us today. We will arrange for one of our technicians to conduct a thorough inspection of your door. This will enable them to determine whether or not it is time to replace your springs or have your existing spring repaired. Repairing your spring will prevent it from breaking. If you are having regular maintenance performed on your door you will know beforehand exactly when it is time to have the spring repaired. This is because whenever we perform maintenance on your garage at J & K Garage Doors, we always inspect the springs to ensure they are in good working condition. We always stand by our work and are willing to offer you guaranteed satisfaction.